Colorado Beagle Rescue, Inc. (CBR) is a nonprofit, tax-exempt organization dedicated to preserving the welfare of the Beagle breed. 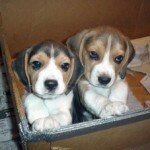 CBR is operated by volunteers who are dedicated to the welfare of the Beagle breed. Colorado Beagle Rescue accepts beagles from owners who can no longer care for them, beagles from shelters and beagles who are found as strays. However, we do not have a facility to house any dog that is available for adoption. Dogs are kept in their own home, foster home, kennel, or shelter until adopted. The organization relies on donations to help with placement of a dog and the basic business expenses. Your donations help us with spaying or neutering, veterinary care, identification tags, administrative and other expenses.